So begins The Dark Crystal (1982), a movie that pushed the limits of what was possible in animation when it was released 32 years ago. That was the year the Commodore 64 hit the market, becoming the best selling personal computer. Ms Pac-man was the hot new item in digital animation. Pixar, as we know it, was more than a decade away. Jim Henson, who wrote, produced, and co-directed the movie with Frank Oz, used models, puppets, and costumes for human actors to make this extraordinary film, which has largely been forgotten now that we’ve come to take sophisticated animation for granted. Dark Crystal is a hero’s quest. A thousand earlier, when the three suns of the planet, Thra, came into alignment, the Dark Crystal shattered. At that moment two new races appeared, the evil skeksis and gentle mystics. Jen is the last of the gelflings (or so he thinks), a race wiped out by the skeksis for fear of a prophesy that one of them would be their undoing. As the thousand year alignment nears, Jen’s master, a dying mystic gives him a quest – find the missing shard and heal the crystal before the suns line up, or the skeksis will rule forever. Jen reacts like any fledgling hero at the start of a quest – “But master, I am only a gelfling “ he says. “I am not ready to go alone.” But go alone he does, aided by the ancient seeress, Aughra, who helps him find the shard, and Kira, last of the female gelflings, who joins his quest. In a moment of despair, Jen flings the crystal shard away. Unable to sleep, he mutters, “Master, nothing is simple anymore.” Kira helps him find the shard at “The House of the Old Ones,” where they are confronted by a treacherous skeksis. They flee, but the treacherous one surprises them at the Dark Castle where the crystal is housed. He captures Kira and the skeksis begin to drain her life essence, which will prolong their own lives and leave Kira in the state of their other slaves, a mindless automaton. Jen and Aughra help Kira to save herself, the mystics arrive at the castle, the three suns’ come into alignment, and the final confrontation begins. Prior to Dark Crystal, animation involved full length cartoons, claymation shorts, and The Muppet Show, which ran on TV from 1976-1981. I’m not aware of another full length feature involving such detailed world-building animation before this movie. It feels a little dated now, but then so do movies like Casablanca which stand as classics in their genre. That’s how I think of Dark Crystal. I think it’s required viewing for lovers of animation and fantasy in the movies. This entry was posted in Fantasy, Movies, Stories and tagged animation, fantasy, Jim Henson, movies, The Dark Crystal. Bookmark the permalink. Thanks for taking me back down Memory Lane with this. I remember taking our young son to see this in the cinema a few years after its release (in those pre-cheap-videos-and-DVD days films often enjoyed a second life) and us both enjoying it immensely. When seen later on TV we thrilled at the rogue Skegsis’ pathetic wheedling ‘Pleeeze, pleeeze’ and squirmed at the giant guards like woodlice. An innovative and for the time unusual film. I remember seeing a documentary on Henson’s “creature shop,” in London I believe. And marveling at the elaborate lengths they had to go to in some of their creations. In retrospect, it appears that the battles he and his team had to wage in order to bend ordinary mechanics to their purposes was a key spark for their creativity. In contrast, digital animation, which makes spectacular graphics much easier, has not resulted in better animated movies. With the exception of “Up” for its heart, and the “Despicable Me” series for its humor, I find most animation these days disappointing in comparison. Henson’s creature workshop is an extraordinary enterprise, responsible for such varied creations as the animals in ‘Babe’, Yoda and the characters in ‘The Muppet Show’, the latter a family fave from when they first aired, after a TV mogul lured Oz and Henson to the UK. While most US animations rely on formulae and stereotypes recognisible to US audiences, I would add the Toy Story series to ‘Up’ for its heart, but certainly not the predictable Ice Age or Madagascar series. The Despicable Me films have a freshness which may come from a French sensibility, but here I would like to put in a plea for the Studio Ghibli output, particularly those by the great Miyazaki. I have never been much of a fantasy reader or watcher, but I do remember this one. It was pretty amazing at the time. Thanks for the memories. 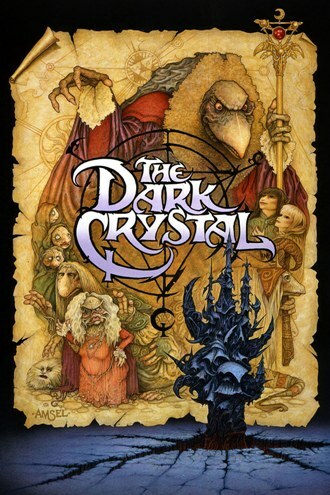 I don’t know quite what sparked it, but even though they’re in different mediums, Dark Crystal and The Diamond Age came to mind at the same time as retrospectives of fantasy classics. I’m glad you enjoyed this movie. Thanks so much for this post – I saw this film when it first came out and remember it as quite wonderful for any number of reasons. Glad you enjoyed the post! I had it on VHS, but no longer have a player so I rented it from iTunes. That and some popcorn made for a mic trip down memory lane.